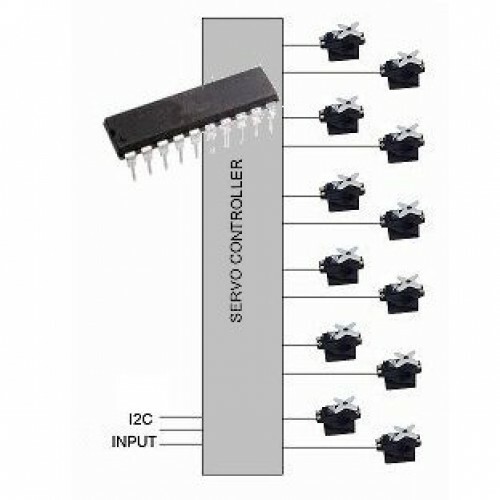 12 Channel Servo Controller IC - We have programmed a microcontroller to act as a slave servo controller which can individually generate 12 pwm output channels suitable for driving servos (or speed controllers which use servo signals). Data is easily sent to this slave device via the I2C protocol. Many microcontroller projects involve the use of external servos for mechanical control, robotics and in continuous rotation mode for driving wheels. 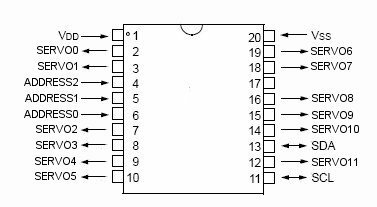 Servos typically require the use of one of the pulse width modulation (PWM) channels in the microcontroller. But microcontrollers usually have only a handful of PWM outputs, and sometimes this is not enough for the project in hand. This is a great value option for controlling up to 12 servos. Easy to use on a breadboard or integrated into your own PCB design. Extended mode sends pwm signals that vary between 0.6ms and 2.4ms. This allows most servos to rotate through almost 180 degrees and is more useful in robotics projects. No additional components are required as it has its own built in oscillator clock circuit.